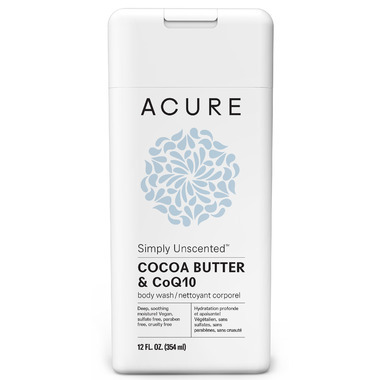 Even the most sensitive skin will love Acure's deep moisturizing body wash. CoQ10 and argan stem cells absorb deeply to replenish lost moisture. Serious, soothing hydration that rinses clean and feels fantastic. Directions: Squeeze small amount onto washcloth, pouf, or hand and work into a rich lather. Apply to body and rinse well. This tube makes a great microphone if you want to belt out some show tunes (we totally know you do). I love this! Very light, natural scent. You only need a small amount for a lot of lather. My skin is very soft and it has helped get rid of all of the little bumps on the back of my arms from the drying, artificially fragranced products. I probably wonâ€™t use any other body wash from now on. The cacao butter has a mild scent, but it's just perfect for me because it's the intense added perfumes in other brands that drive me nuts. Great product - so moisturizing in the shower.